Under the Data tab, when you click on Select Information, a list of information (assessments) will be displayed on the right. There are 4 possible lists of Information, but depending on your Student Selection, all 4 lists might not be visible. The lists can also vary between users, based on their access. • List of all of the information in your VCAT system. • List of all the information related/linked to the group of students you have selected for the year selected and previous years. • List of all the information linked to the group of students you have selected for the selected year only. • List of all the information linked to the group of students you have selected for the selected year, based on your 'Edit Access' (Ability to enter data). Locked information will also be listed even though it will not be 'editable'. The list of information can be lengthy and spread over multiple pages. By default, only the first page will be displayed. At the top of the list, you can adjust the number of entries per page if you like or use the filter bar to shorten the list to facilitate the information selection. 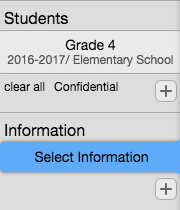 The list of information can be filtered by Type, Grade, and/or Subject to shorten the selection list. Use the Clear button on the right of the Subject filter to cancel all filters. By default, only the current versions for the information are visible and available for selection. To see any information that is retired (not current version), check the Show Retired box. The Clear button to the right of the filter bar will clear filters for Type, Grade, Subject, and Entries Per Page. Data Entry, Viewing Data, and access to Curriculum, Assessment, and Rubric pages will be available with a single piece of information selected. 1. Click on Select Information in the Information box to bring up the list of information. If any information had previously been selected, clicking on it in the Information box will allow you to change your selection. When your information is highlighted in blue, selecting a different piece of Information by clicking on its name will replace the previous selection. 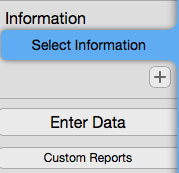 For Entering Data, only one piece of information can be selected. For Viewing Data, single or multiple pieces of information can be selected. 2. Click on the Information (e.g. 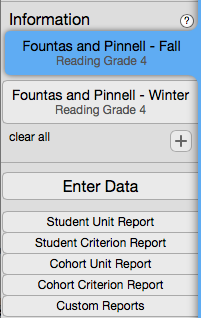 Reading Grade 4) to reveal its unit(s) and select the unit you wish to enter or view data for (e.g. 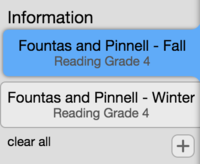 Fountas and Pinnell - Fall) by clicking on its name or in the checkbox in front of it. 1. Remove the check by clicking in the checkbox in front of the information selected. 2. Hover in the information box of the selected information, an X will appear on the left corner. Simply click on the X to unselect the information. 3. Click on clear all to unselect the information selected. 4. You can also unselect the information selected and replace your selection with a new piece of information by clicking on its name. If you click in the checkbox instead of its name, it will add this selected information and will NOT replace your original selection. NOTE: The list of information can be lengthy and spread over multiple pages. By default, only the first page will be displayed. At the top, you can adjust the number of entries per page if you like or use the filter bar. The list of information can be filtered by Type, Grade, and/or Subject to narrow down the selection. Use the Clear button on the right of the Subject filter to cancel all filters. When multiple pieces of information are selected, you can view, compare, and analyze the data. 2. After selecting one piece of information, click on the + right below the Information Box. It will add a box for which you just select the information by clicking its name or checking the box in front of its name. 1. Click on its name in the information list on the right. 2. Remove the check by clicking in the checkbox in front of the information you wish to unselect. 3. Hover in the information box of the selected information you wish to unselect, an X will appear on the left corner. Simply click on the X to unselect the information. 4. Click on clear all to unselect all pieces of information selected. If the Information you wish to view is Retired, you will need to check the Show Retired box in the filter bar, at the top, in order to have access to it. By default, only the information with a current version is listed. Click the Show Retired checkbox to include in the list all retired information (units), and make the retired information available for selection. Each piece of information will have a Curriculum, an Assessment, and a Rubric page. Each page may contain various details. These pages can only be accessed/viewed when ONLY ONE piece of information is selected. Select Curriculum to view the curriculum page of the information selected. The curriculum page will contain the name of the unit, the name of the course this unit is part of, and the Type, Grade, Subject linked to it. It can also include elements of the Understanding by Design Framework (Essential Questions, Students will understand that, Students will know,...), Activities, Resources, and Standards addressed in this unit. Select Assessment to view the assessment page of the information selected. The assessment page will contain the name of the unit, the name of the course this unit is part of, and the Type, Grade, Subject linked to it. It can also provide details about the task, the materials needed - including links for student worksheets, and any additional directions that would be helpful to the teachers. It also mentions if this assessment is required or not. 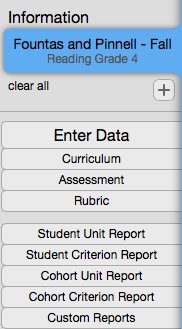 Select Rubric to view the rubric page of the information selected. The rubric page will contain the name of the unit, the name of the course this unit is part of, and the Type, Grade, Subject linked to it. It provides details about what is being measured and how it is measured. It lists the criteria, their possible scores, and can include a panoply of attributes (e.g. Terms, Scales, Weight, Standards, Criterion Description, Rating Description,...). This page was last modified on 30 January 2018, at 20:08. This page has been accessed 99,494 times.